Steamer: Full length arm and full length leg wetsuit. Ideal for Winter and cold climates or people who feel the cold even when it’s not! Short arm steamer: Half length arm (like a t-shirt) and full leg length. Ideal for spring or short winter surfs if you are warm blooded. Springsuit: (Or Springy) Short arm and Short leg length. Can also come with a long arm and short leg. Great for spring and Summer. Long John and Short John: Sleevless in the arms (Like a singlet) and either has a long leg length or short leg length. Frees you shoulders for paddling. Jacket or wetsuit top: Can be long arm or short arm and only covers yours torso. Can have no zip, half back zip or full front zip. Perfect for a warm summer. The thickness of a wetsuit will not only greatly affect how warm a wetsuit will be but also how flexible it will be. For Sydney & Byron Bay water and air temperatures the most common thickness is a 3/2mm. The 3 represents the thickness in the torso area and the 2 represents the thickness in the arm and other flex areas. If you get cold easy or head south regularly a 4/3mm might be the suit you require. The warmer you are the longer you can surf but the more restricted you are in movement. These days only the entry level or low cost wetsuits will not be sealed but what does this mean? A sealed wetsuit is one where the seams of the suit are not only stitched together but also glued or sealed with liquid tape to limit water from seeping into the suit and making you cold. There are a few different ways a wetsuit can be sealed and the better the wetsuit is sealed the more expensive the wetsuit generally is. Liquid Taped: The ultimate seam seal. A special liquid rubber is applied to the inside seam which makes it 100% waterproof. Traditionally surfing wetsuits have had a zipper on the back of the wetsuit for easy entry. The zipper was also located on the back so you weren’t lying on an uncomfortable zipper. With advancements in the flex of neoprene the Chest Zip wetsuit has become the new go to wetsuits. Chest Zip suits are more flexible through the back as there is no zipper sewn into the suit. They are also more water tight as there is no zipper for the water to seep through. The main disadvantage though is they can be harder to get into especially if you have a larger frame. No 5. What Size Am I? 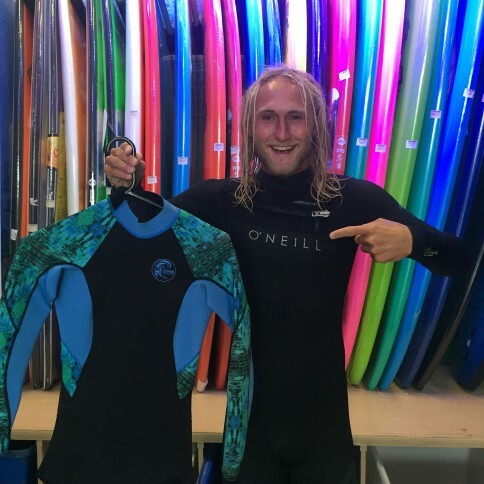 If you give yourself an hour or so to try on wetsuits, find the best fit, take some advice from someone you trust, you will be buying the right suit that should last you years…So our advice is buy the best wetsuit you can afford!!!!! From inside the Lets Go Surfing Rubber Room!